On a night of carefree teenage partying in the woods, Paige Pritchard unwittingly sets in motion a chain of events that will plunge her into a waking nightmare. Tormented by terrifying and increasingly violent supernatural visitations, Paige starts digging into the past and uncovers a sinister secret, buried for decades. Behind the deadly force that now haunts her is a malevolent entity of unspeakable evil. As its power grows and her friends fall prey to its savagery, can she or anyone stop The Poltergeist of Borley Forest? THE POLTERGESIT OF BORLEY FOREST was directed by Stephen McKendree and written by Kimberly Britt and R. Presley Stephens, the film stars Marina Petrano, Christopher Ingle and Rhea Rossiter. 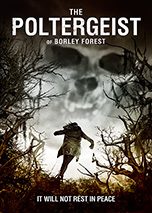 THE POLTERGESIT OF BORLEY FOREST will be available on Digital Video and DVD for an SRP of $27.97 on June 2, 2015. Disclaimer: This is a post letting you know of a movie coming out.